Red wines have one🍷and white wine lovers feel left out. So the campaign is on for a white wine emoji. A group of United States wineries and leading the fight for justice. Kendall-Jackson have taken the first step. 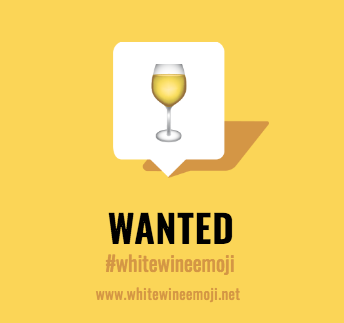 The company's submission for a White Wine Emoji has been accepted for review by  the Unicode Consortium (the governing body that coordinates and sets global coding standards). "But our work isn't over," says its emoji website. "Let's create some noise and show the Unicode Technical Committee just how WANTED the White Wine Emoji really is."